This looks absolutely beautiful in my granddaughter's bedroom! This beautiful chandelier features a 4-light design and is decorated and draped with crystals that capture and reflect the light of the bulbs. The frame is wrought iron, adding the finishing touch to a wonderful fixture. 4 Lights , Height 14" X Width 15" Chandelier comes with both hardwire and plug in options so you have a choice which to use ! Assembly required .Professional installation is recommended. Requires (4) 25 watt candelabra bulbs. Comes with 24" of chain/wire for hardwire and 12 feet for plug in ! Dimensions 15.0 In. X 15.0 In. X 14.0 In. Very pretty chandelier. Well packaged - arrived undamaged. All crystals came already attached. Easy to hang - love that it can be hardwired OR plugged in. Changing the color and/or style of the bulbs makes it easily adaptable. Currently have violet bulbs in it! Beautiful light fixture for the bathroom I designed for a client. This is going above a claw foot tub and is the perfect addition to the design. It is not too fancy for the small area, but gives an elegance that the client loves!! I bought this chandelier for my daughters room and it was perfect!!! You can put it in or have it wired to the exciting wires.. We decided to have it wired but almost want to buy another one to hang in another room that we can plug into the wall if we wanted!! Its super cute!! 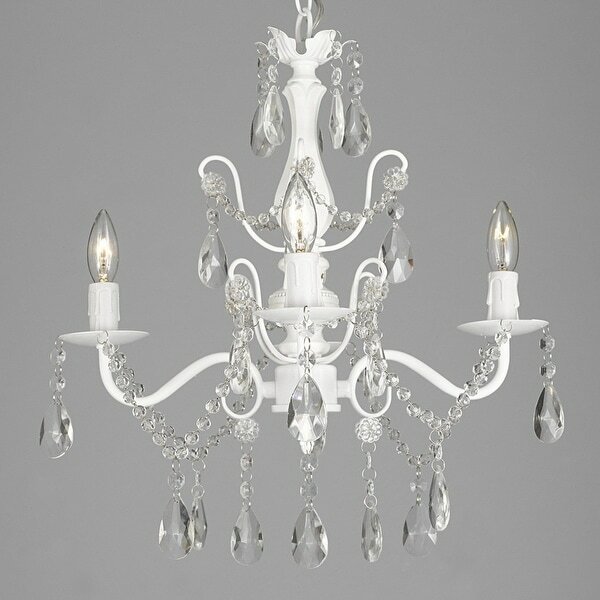 I bought this chandelier to liven up my gorgeous new bathroom. It is absolutely perfect in the selected space! It was simple to put together (adding crystals) and looks FABULOUS! The price was right, too. I bought a second one for my Master bedroom sitting room! Got this precious chandelier to go in my bathroom and it is PERFECT!!!! The perfect size, the perfect color and the perfect amount of bling! Everyone that sees my new bathroom comments on the chandelier! Love! I used these instead of lamps for my nightstands. Room isn't finished yet but can't wait to make my headboard out of old doors and see how great they look on both sides! Great purchase for my daughter's room! It was just the right size since her ceiling is standard height, so it's not overwhelming for the space. There is nothing negative to say. It's even prettier in person and did not disappoint. I would absolutely reccomend it to anyone that asked. Looks perfect! Can't wait to see it over my tub. This was a great addition to my goddaughter’s nursery! This was a bit of a disappointment. It was much smaller than expected. Very pretty though. It ended up not working in our space because it wasn't large enough. Much better then what I expected. I’m pleased the purchase. "Is this good for a damp location (bathroom)?" there was an item that was the same, but about 20 $ cheaper. So we went with this. "are the cyrstals glass or plastic"
They are plastic but you can't tell unless you touch it. Murano Venetian Italian Style 8 Light Blown Glass in Cranberry Finish Chandelier Large 27" x 27"